Comet Encounter: Comet of the Century re-aired December 25, 2013. 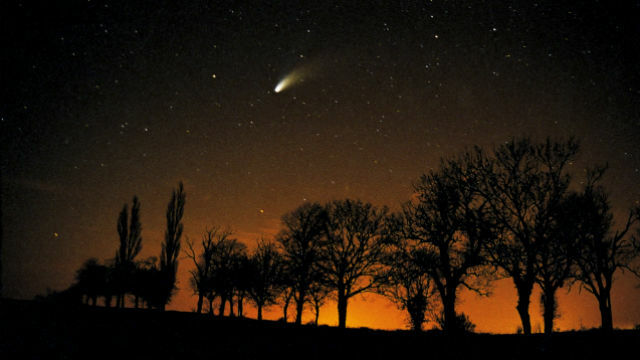 Follow a once-in-a-lifetime event — Comet ISON’s brush with the sun. Comets have fascinated, even terrified us for thousands of years. For scientists though, comets are a great opportunity. This year, 2013, a particularly massive chunk of ice and rock is coming our way, an object that will fascinate billions and should create the space show of the century. Right now Comet ISON, somewhere between one and 10 kilometers in diameter, is just beyond the orbit of Jupiter. As it races past us toward the sun it should develop a tail that will light up the skies brighter than a full moon. Then the comet will slingshot around the back of the sun and could emerge brighter than ever, treating the entire northern hemisphere to an unforgettable sight. In this program, scientists all over the world follow a once-in-a-lifetime event and shoot breathtaking images, spewing its essence into the void. But there is jeopardy too; the comet could evaporate completely or the sun's massive gravity could tear it apart. If the latter happens it will produce a so-called "string of pearls," several much smaller comets arching right across the night sky. Comet Encounter was produced by Darlow Smithson Productions. Follow scientists on the trail of the once-in-lifetime Comet ISON.